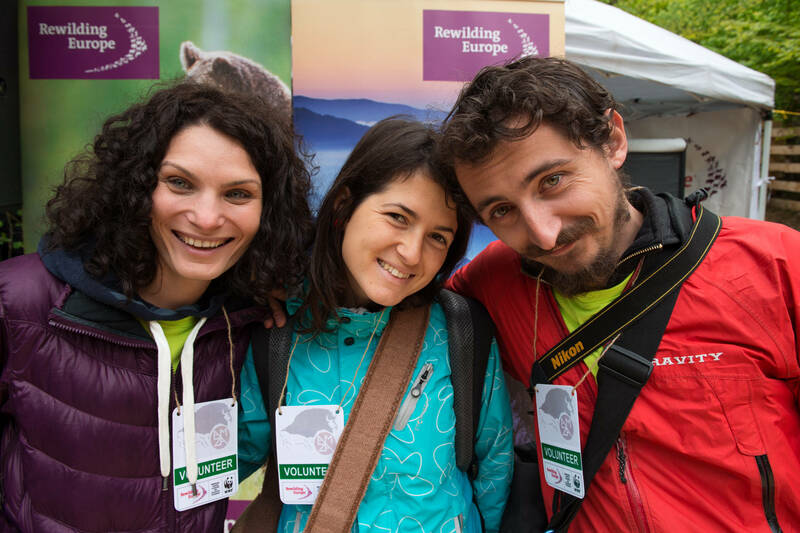 Rewilding Europe is excited to announce that six enthusiasts have recently joined our rewilding team on a voluntary basis. After our announcement in February when we offered for two volunteer positions we were happily surprised by the response we received. Guess what – we were so excited that we accepted our four first volunteers at the central level, while two volunteers will support the communication at a local level. They have already started working and here you can read their short background and main activities for this year. Laura Summers (originating from UK) has started with proof-reading, editing and styling our print and website publications. Laura graduated in English Language and Literature from the University of Leeds, and went on to gain a secondary teaching certification from the University of Cambridge, and an MSc in Counselling Studies from the University of Edinburgh. She has lived and worked in different parts of Asia, Australia and Europe. Now living in a small mountain village in Switzerland, it was hiking in the Swiss and Italian Alps that made her excited about the idea of rewilding. Arne Loth will dedicate his volunteer time to write blog entries for the Rewilding Europe website. Originally from Hamburg (Germany), Arne is now based in the UK, pursuing a Master’s degree in Biodiversity Conservation. From a young age onwards, he has always had a strong affinity for wildlife. Arne is particularly interested in the intersections of nature conservation, language and literature, and in helping to raise awareness about biodiversity and rewilding outside the scientific community. James Whiteman will be helping in expanding the Rewilding Europe Travel Club and help the safari-section on our website to develop. Born near London, James’ formative years were spent travelling much of Europe, and Southeast Asia, including riding up the length of Vietnam on a Honda motorcycle and looping back through Laos and Cambodia. After earning a History degree from the University of Southampton in 2010, the two-wheeled obsession continued on his next expeditions in South America. For two years he worked as a freelance travel writer and in marketing wildlife voluntourism. James next spent two months writing for an ecolodge in India’s Jim Corbett National Park, before three months in Botswana as marketer and photographer for a helicopter safari company, before returning to London to work in the luxury travel sector. Ana Cravo from Lisbon, Portugal is a communication volunteer in Western Iberia. She already visited the area and came back with great impressions that she will use in her first blog entry for the Rewilding Europe website. In November 2010, Ana completed a Masters degree in Environmental Engineering at the Technical University of Lisbon, and since then she has been working as an environmental engineer for several companies in the banking, scientific research and public administration sectors. In 2013, she attended a postgraduate course on Science Communication at the New University of Lisbon. Nelly Naydenova from Sofia, Bulgaria has become a communication volunteer at Rewilding Rhodopes. She holds a Masters Degree in Environmental Science and Policy, and has always had a strong interest in the protection of nature and conservation. Nelly spent her mid-twenties working as an environmental reporter in Bulgaria as she strongly believes that science needs to be communicated using a language comprehensible to everyone. Nelly is extremely passionate about large carnivores having dedicated the last two summers to working as a volunteer at the Bear Refuge Center in Velebit, Croatia. Recently, she developed an interest in environmental education. Having been to the Rhodope Mountains several times, she adores the area, and takes every opportunity she has to go there. Virginia Frej from Stockholm, Sweden will be working on setting up and servicing the Rewilding Europe Circle, which will be launched later this year. Virginia has been working for the Swedish Ministry of Foreign Affairs and various Swedish consulates, and is now working for the Swedish Embassy in London. She has a lot of experience with building and managing relationships at all levels and is excited to work for us, on a voluntary basis to start with. A very warm welcome to our volunteers! This is a great step forward for our initiative and we are looking forward to working with all of them! See more about our volunteers.